Thanks for stopping by! I had a great week, and I sure hope you did too. Last week was National Library Week, so I took my 3 year old to the library for story time. We had fun and ended up with a bag full of books as usual. One of those books was Book! Book! Book! by Deborah Bruss, which was perfect for this special week. You can click the title for my review. I also published a review of Forget Me Not by Vicki Hinze last week, which some of you may have seen since it was put up shortly after publishing my It's Monday post last week. And I read and reviewed Guest House by Barbara K. Richardson, which I really loved. It's a wonderful story with some very interesting characters that Richardson really brings to life with her writing. And finally, I published my weekly What My Children Are Reading recap. I'm making my way through the last few chapters The Power of Your Child's Imagination, which I'm reading for a blog tour. I'm scheduled to post my review on Wednesday, so check back for that. I'm starting Rebecca by Daphne du Maurier this week. This is my book club's May selection. Unfortunately, the copy I have is a mass market paperback, and if you read my post last week about book formats, you'll know that's my least favorite. So I'm hoping it doesn't take me forever to make my way through it. I'm not sure what I'll read after that, but I'm planning to make it something from my Spring Reading Thing Challenge list. 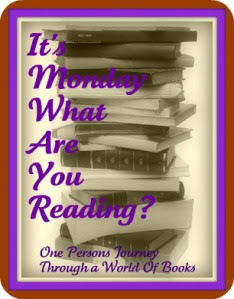 So, what are you reading this week? This meme is being hosted by Sheila at Book Journey (formerly One Persons Journey Through a World of Books), so hop over there if you'd like to see what others are reading too. I'm not a huge fan of mass market paperback either. I actually prefer paperback to hard cover, but I like the nicer paperbacks. I hope that you enjoy Rebecca as well. It is one of my favorites! I love my library and end up there at least twice a week. Book! Book! Book! sounds cute. I see Glass Castle on your Spring Challenge. I read that quite a while ago but remembering enjoying it. I am a big supporter of my local and school library. Hope you enjoy Rebeca. Have a great week. I so loved Rebecca when I read it, but it was almost in another lifetime! When I find time, I'm going to reread it. Guest House is on my list. rebecca is wonderful. it is such an atmospheric novel that it is easy to forget how well crafted the plot is. have you seen the film 'finding neverland'? it is about j.m. barrie and a branch of du maurier's family. it gives you an idea of how surrounded by stories and books she was from childhood. i am so glad i found your blog! I've been reading some great reviews on Forget Me Not. I will have to check that one out! Right now I'm reading a Gina Lake book about relationships called Loving in the Moment. Great perspective on how to relate to one another in a non-judgmental way. I just love love love story time at the library! It's even more fun now that both my son and daughter are old enough to really enjoy it. I'm so glad to hear it went so well for you! I really want to read Forget Me Not and my sister is a huge huge fan of Rebecca! Hope you have a fabulous reading week! That is so cool that you took your three year old to the Library Julie! What a great moment!